Palestine (from Latin: Palaestina; Hebrew: ארץ־ישראל Eretz-Yisra'el, formerly also פלשתינה Palestina; Arabic: فلسطين Filasṭīn, Falasṭīn, Filisṭīn) is one of several names for the geographic region between the Mediterranean Sea and the Jordan River and various adjoining lands. Different geographic definitions of Palestine have been used over the millennia, and these definitions themselves are politically contentious. In recent times, the broadest definition of Palestine has been that adopted by the British Mandate, and the narrowest is that used in contemporary politics today, called the Palestinian territories, which are the West Bank and Gaza Strip. Other English names for this region include Canaan, Land of Israel, and Holy Land. Part of the region is known as the Holy Land and is held sacred by Judaism, Christianity and Islam. Since the early twentieth century it has been subject to conflicting claims of Jewish and Arab national movements, leading to ongoing violence. The term "Palestine" derives from the word Philistia, the name given by Greek writers to the land of the Philistines, who in the twelfth century B.C.E. occupied land between modern Tel Aviv and Gaza. The word in Hebrew is פְּלְשְׁתִּים (Pelishtim), this word is derived from the word פְּלִישָׁה (Pelisha), meaning invasion or incursion. During the Roman period, the Iudaea Province (including Samaria) covered most of Israel and the Palestinian territories. But following the Bar Kokhba rebellion in the second century, as part of a program of cooptation and forced migration, the Romans tried to erase the Jewish connection to the land of Judea, renaming it Syria Palaestina. The name made its way thence into Arabic, where it has been used to describe the region at least since the early Islamic era. "Palestinian people," "Palestinians," or "Palestinian Arabs" are terms used to refer mainly to Arabic-speaking people with family origins in Palestine. Palestinians are predominantly Sunni Muslims, though there is a significant Christian minority. Palestinians are represented before the international community by the Palestine Liberation Organization (PLO). The Palestinian National Authority was created as a result of the Oslo Accords is an interim administrative body responsible for governance in Palestinian population centers in the West Bank and Gaza Strip. It is no longer in control of the Gaza Strip, which is now governed by Hamas, but still claims de jure authority. The Palestinian National Charter, as amended by the PLO's Palestine National Council in July 1968, states that "The Palestinians are those Arab nationals who, until 1947, normally resided in Palestine regardless of whether they were evicted from it or stayed there. Anyone born after that date, of a Palestinian father — whether in Palestine or outside it — is also a Palestinian." It further states that "Jews who had normally resided in Palestine until the beginning of the Zionist invasion are considered Palestinians," and that the "homeland of Arab Palestinian people" is Palestine, an "indivisible territorial unit" having "the boundaries it had during the British Mandate." The most recent draft of the Palestinian constitution expands the right of Palestinian citizenship to include all those resident in Palestine before May 15, 1948, and their descendants, specifying that, "This right is transmitted from fathers and mothers to their children ... and endures unless it is given up voluntarily." The name Palestine has long been used as a general term for a region without precise boundaries. The eastern boundary has been especially imprecise, although frequently regarded as east of the Jordan River, sometime extending to the edge of the Arabian Desert. The northern border is between modern Israel and Lebanon, to the west is the Mediterranean Sea, and the south, the Negev, sometimes reaching the Gulf of Aqaba. The sovereign territory of Israel, excluding all territories captured by Israel in 1967, is 8,019 square miles (20,770 square kilometers) in area, or slightly smaller than New Jersey in the United States. 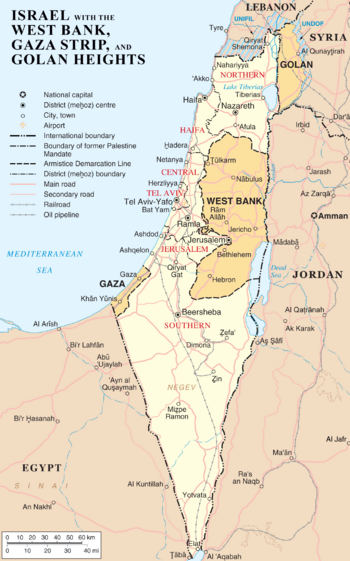 The West Bank is a landlocked territory that has a total area of 2,262 square miles (5,860 square kilometers), slightly smaller than the U.S. state of Delaware. The Gaza Strip has a 32-mile (51 kilometers) border with Israel, a seven-mile (11 kilometers) border with Egypt, and an area of 139 square miles (360 square kilometers), slightly more than twice the size of Washington, D.C.
Israel is divided east-west by a mountain range running north to south along the coast. Jerusalem sits on the top of this ridge, east of which lies the Dead Sea. The numerous limestone and sandstone layers of the Israeli mountains allow the water to pour from the west flank to the east. Several springs have formed along the Dead Sea, each an oasis, most notably the oasis at Ein Gedi and Ein Bokek, where settlements have developed. Israel also has a number of large limestone karsts. These caves are around 68 °F (20 °C), although only one is open to the public. Very common all around the country are small natural caves that have been used for thousands of years as shelter, housing, storage rooms, barns and churches. Israel is divided into four main geographical regions: the Israeli Coastal Plain, the central hills, the Jordan Rift Valley, and the Negev Desert. The coastal plain stretches from the Lebanese border in the north to Gaza in the south, interrupted only by Cape Carmel at Haifa Bay. It is about 25 miles (40 kilometers) wide at Gaza and narrows toward the north to about three miles (5 kilometers) at the Lebanese border. The region is fertile and humid, has had problems with malaria, and is known for its citrus and viniculture. The plain is traversed by several short streams. East of the coastal plain lies the central highland. In the north lie the mountains and hills of Galilee; farther to the south are the Samarian Hills with numerous small, fertile valleys; and south of Jerusalem are the mainly barren hills of Judea. The central highlands average 2,000 feet (610 meters) in height and reach their highest elevation at Har Meron, at 3,963 feet (1,208 meters) in Galilee near Safed. East of the central highlands lies the Jordan Rift Valley, which is a small part of the 4,040-mile (6,500-kilometer) Great Rift Valley. In Israel the Rift Valley is dominated by the Jordan River, the Sea of Galilee (an important freshwater source also known as Lake Tiberias and to Israelis as Lake Kinneret) and the Dead Sea. The Jordan River, Israel's largest river at 200 miles (322 kilometers), originates in the Anti-Lebanon Mountains and flows south through the drained Hulah Valley into the freshwater Lake Tiberias. With a water capacity estimated at 106 billion cubic feet (three cubic kilometers), it serves as the principal reservoir for Israel. The Jordan River continues from the southern end of Lake Tiberias (forming the boundary between the West Bank and Jordan) to the highly saline Dead Sea, which is 393 square miles (1,020 square kilometers) in size and, at 1,309 feet (399 meters) below sea level, is the lowest point in the world. The Negev Desert comprises approximately 4,600 square miles (12,000 square kilometers), more than half of Israel's total land area. Geographically it is an extension of the Sinai Desert, forming a rough triangle with its base in the north near Beersheba, the Dead Sea, and the southern Judean Mountains, and it has its apex in the southern tip of the country at Eilat. The terrain in the West Bank is mostly rugged dissected upland, some vegetation in west, but barren in east. It is mostly composed of north-south-oriented limestone hills, called the Samarian Hills north of Jerusalem and the hills of Judea to the south, with a height of 2,300 to 3,000 feet (700 to 900 meters). The hills descend to the east to the low-lying Jordan rift valley and the Dead Sea. The coastal climate differs from that of the mountainous areas, particularly during the winter. The northern mountains can get cold, wet and often snowy, and even Jerusalem has snow every couple of years. The coastal regions, where Tel Aviv and Haifa are located, have a typical Mediterranean climate with cool, rainy winters and hot, dry summers. January is the coldest month with average temperatures ranging from 43 °F to 59 °F (6 °C to 15 °C), and July and August are the hottest months at 72 °F to 91 °F (22 °C to 33 °C) on average across the state. In Eilat, the desert city, summer daytime-temperatures at times reach 111 °F to 115 °F (44 °C to 46 °C). More than 70 percent of the rain falls between November and March. The most cultivated areas receive more than 12 inches (300 millimeters) of rainfall annually; about one-third of the country is cultivable. The climate in the West Bank is temperate; temperature varies with altitude, with warm to hot summers and cool to mild winters. Annual rainfall of more than 27 inches (685 millimeters) occurs in the highest areas in the northwest and declines in the southwest and southeast, along the Dead Sea, to less than four inches (100 millimeters). Natural hazards include sandstorms during spring and summer, droughts, and periodic earthquakes. Thunderstorms and hail are common throughout the rainy season and waterspouts occasionally hit the Mediterranean coast, capable of causing only minor damage. However, supercell thunderstorms and a true F2 tornado hit the Western Galilee April 4, 2006, causing significant damage and 75 injuries. Limited arable land and natural fresh water resources pose serious constraints, while the nation must deal with ongoing problems of desertification, air pollution from industrial and vehicle emissions, groundwater pollution from industrial and domestic waste, and toxic residue from chemical fertilizers, and pesticides. 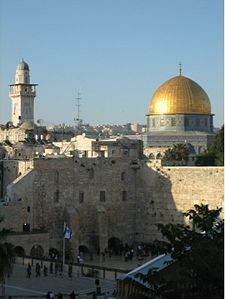 Jerusalem has been continuously settled for more than three thousand years and is the location of many sites of historical and religious significance for Judaism, Christianity and Islam, including the Dome of the Rock, the Wailing Wall, the Church of the Holy Sepulchre, and the Tomb of the Virgin Mary. The Old City has the Jewish, Christian, Muslim, and Armenian quarters. Israel's "Basic Law" states that "Jerusalem, complete and united, is the capital of Israel," although the Palestinian Authority sees East Jerusalem as the future capital of Palestine. Metropolitan Jerusalem had a total population of 2.3 million in 2006, including 700,000 Jews and 1.6 million Arabs. Tel Aviv had a population of 3,040,400, Haifa had 996,000 and Beersheba had 531,600. Gaza City has a population of approximately 400,000. Human remains found south of Lake Tiberias date back as early as 600,000 B.C.E. The discovery of the "Palestine Man" in the Zuttiyeh Cave in Wadi Al-Amud near Safad in 1925 provided some clues to human development in the area. In the caves of Shuqba in Ramallah and Wadi Khareitun in Bethlehem, stone, wood and animal bone tools were found and attributed to the Natufian culture (12,500 B.C.E.–10,200 B.C.E.). The Natufians lived in caves, as did their Paleolithic predecessors, and it is possible that they were experimenting in agriculture. 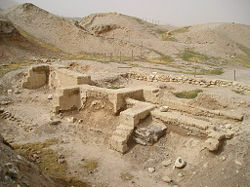 Other remains from this era have been found at Tel Abu Hureura, Ein Mallaha, Beidha and Jericho. People between 10,000 B.C.E. and 5000 B.C.E. gradually domesticated animals, cultivated crops, produced pottery, and built towns. Evidence of such settlements were found at Tell es-Sultan, Jericho and include mud-brick rounded and square dwellings, pottery shards, and fragments of woven fabrics. The Ghassulian period was an archaeological stage dating to the Middle Chalcolithic Period (Copper Age) in southern Palestine (c. 3800–3350 B.C.E.). They are so named because the pottery and flints characterizing their settlements were noticed in the excavations of Tulaylat al-Ghassul in the Jordan Valley near the Dead Sea in the modern nation of Jordan in the 1930s. People from this era lived in small hamlet settlements, and migrated southwards from Syria into Palestine. Houses were trapezoid-shaped, built with mud-brick and covered with remarkable wall paintings. Their pottery was highly elaborate, including footed bowls and horn-shaped drinking goblets, indicating the cultivation of wine. They buried their dead in stone dolmens. At Beersheba there was a copper-working industry, and also evidence of an ivory-working industry. The Ghassulian phase led to the Canaanite civilization, the economy of which produced fruit and vegetables, grains and cereals, had transhumance and nomadic pastoral systems of animal husbandry, and commercial production of wine and olives. The Canaanites were a smaller ethnic group radiating out of modern day Lebanon, who are mentioned in the Bible and ancient Egyptian texts, and who are only one among many ethnic groups in this area. Most of these ethnic groups assimilated to the same wider culture and are sometimes difficult to distinguish from each other. By the early Bronze Age (3000–2200 B.C.E.) independent Canaanite city-states were established in plains and coastal regions and surrounded by mud-brick defensive walls, and most of these cities relied on nearby agricultural hamlets for food needs. These city-states held trade and diplomatic relations with Egypt and Syria. Parts of the Canaanite urban civilization were destroyed around 2300 B.C.E., though there is no consensus as to why. In the Middle Bronze Age (2200–1500 B.C.E. ), Canaan was influenced by the surrounding civilizations of Egypt, Mesopotamia, Phoenicia, and Syria. Nomads came probably from east of the Jordan River, and included the Amorites from the Syrian Desert, who lived in the hill country, as opposed to the Canaanites who lived in the plains and on the coast—areas favorable to agriculture. Diverse commercial ties and an agriculturally-based economy led to the development of new pottery forms, the cultivation of grapes, and the extensive use of bronze. Burial customs from this time seemed to be influenced by a belief in the afterlife. Political, commercial and military events during the Late Bronze Age (1450–1350 B.C.E.) were recorded by ambassadors and Canaanite proxy rulers for Egypt in several hundred cuneiform documents known as the Amarna Letters. Shortly before the death of Ahmose I (1514 B.C.E. ), Egyptian armies began to conquer Palestine. The land Syria-Palestine, known to Egyptians as Retenu, was divided into three administrative districts, each under an Egyptian governor. 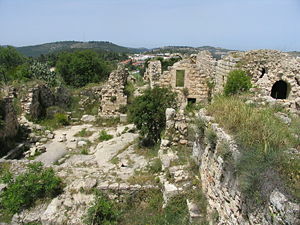 The third district, Canaan, included all of Palestine from the Egyptian border to Byblos. About 1292 B.C.E., the increasingly weak rule of the last pharaohs of the eighteenth dynasty was replaced by the strong arm of the second and third kings of the nineteenth dynasty, Seti I and Rameses II (1279–13 B.C.E. ), who consolidated the crumbling Egyptian empire. The historic Philistines (Hebrew פְּלְשְׁתִּים, plishtim; Arabic: فلسطين Filasṭīn, Falasṭīn) were a people who invaded the southern coast of Canaan around the time of the arrival of the Israelites, about 1250 B.C.E., their territory being named Philistia in later contexts. Their origin has been debated among scholars, but modern archaeology has suggested early cultural links with the Mycenean world in mainland Greece. The Philistines occupied the five cities of Gaza, Ashkelon, Ashdod, Ekron, and Gath, along the coastal strip of southwestern Canaan, which belonged to Egypt up to the closing days of the Nineteenth Dynasty (ended 1185 B.C.E.). The biblical stories of Samson, Samuel, Saul and David include accounts of Philistine-Israelite conflicts. The Philistines long held a monopoly on iron-smithing (a skill they possibly acquired during conquests in Anatolia), and the biblical description of Goliath's armor is consistent with this iron-smithing technology. There was almost perpetual war between the Philistines and Hebrews. They sometimes held the Hebrews, especially the southern tribes, in servitude; at other times they were defeated with great slaughter. According to the Bible, the Philistine cities were ruled by seranim (סְרָנִים, "lords") who acted together for the common good. After their defeat by the Hebrew king David, who originally for a time worked as a mercenary for Achish of Gath, kings replaced the seranim, governing from various cities. Some of these kings were called “Abimelech,” which was initially a name and later a dynastic title. Pottery remains found in Ashkelon, Ashdod, Gat, Ekron and Gaza decorated with stylized birds provided the first archaeological evidence for Philistine settlement in the region. The Philistines are credited with introducing iron weapons and chariots, as well as new ways to ferment wine. Though there is a debate over whether the Hebrews arrived in Canaan from Egypt, or emerged from among the local population existent there at the time, these events are generally dated to between the thirteenth and twelfth centuries B.C.E. From about the time the Philistines settled the entire Middle East fell into a "Dark Age" from which it took centuries to recover. The Biblical book of Genesis relates how some of the descendents of Israel became Egyptian slaves. Some Bible commentaries place the birth of Moses around 1300 B.C.E. The Exodus of the Israelites from Egypt, led by Moses, and its chronology are much-debated. Some believe that the Exodus took place in the reign of Rameses II (1279 B.C.E. to 1213 B.C.E.) due to the Egyptian cities named in Exodus (Pithom and Rameses). Evidence for an Israelite presence in Palestine has been found from only six years after the end of the reign of Rameses II, in the Merneptah Stele, documenting military campaigns in Canaan. The demands of foreign bureaucrats, combined with internal decay, had weakened the Canaanite vassal princes of Palestine. 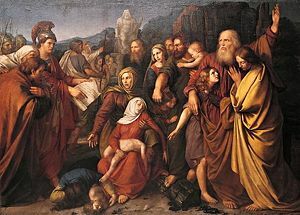 In their initial attacks under Joshua, the Hebrews occupied most of Canaan, which they settled according to traditional family lines derived from the sons of Jacob and Joseph (the "tribes" of Israel). No formal government existed and ad hoc leaders, or the "judges" of the biblical Book of Judges, led in times of crisis. Around 1140 B.C.E., the Canaanite tribes attempted to destroy the Israelite tribes of northern and central Canaan, but were defeated. Wealth returned to the region by the end of the period from the collapse of the Mycenaean kingdoms, the Hittite Empire in Anatolia and Syria, and the Egyptian empire in Syria and Palestine, between 1206 and 1150 B.C.E., to the rise of settled Aramaean kingdoms of the mid-tenth century B.C.E., and the rise of the Neo-Assyrian Empire. Friction between Philistines and Israelites over trade caused the Israelites to unite under one king around 1050 B.C.E. Samuel, one of the last of the judges, anointed Saul from the tribe of Benjamin as king. In 1000 B.C.E., Jerusalem made the capital of King David's kingdom and it is believed that the First Temple was constructed in this period by King Solomon. By 930 B.C.E. 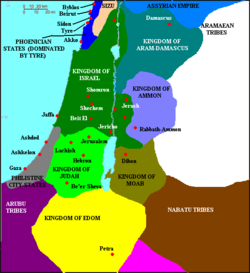 the kingdom was split into two kingdoms: the northern Kingdom of Israel, and the southern Kingdom of Judah. Archaeological evidence indicates that the late thirteenth, the twelfth and early eleventh centuries B.C.E. witnessed the foundation of perhaps hundreds of insignificant, unprotected village settlements, many in the mountains of Palestine. From around the eleventh century B.C.E., there was a reduction in the number of villages, though this was counterbalanced by the rise of certain settlements to the status of fortified townships. Between 722 and 720 B.C.E., the northern kingdom of Israel was destroyed by the Assyrian Empire and the Hebrew tribes—thereafter known as the Ten Lost Tribes—were exiled. In 586 B.C.E., Judah was conquered by the Babylonian Empire and Jerusalem and the First Temple were destroyed. Most of the remaining Hebrews, and much of the other local population, were sent into slavery in Babylonia. Cyrus II of Persia conquered the Babylonian Empire by 539 B.C.E. and incorporated Judah and Palestine into the Persian Empire. Cyrus organized the empire into provincial administrations called satrapies. The administrators of these provinces, called satraps, had considerable independence from the emperor. The Persians allowed Jews to return to the regions that the Babylonians had exiled them from. The exiled Jews who returned to the lands they had occupied encountered the Jews that had remained, surrounded by a much larger non-Jewish majority. One group of note (that exists up until this day) were the Samaritans, who adhered to most features of the Jewish rite and claimed to be descendants of the Assyrian Jews. They were not recognized as Jews by the returning exiles for various reasons (at least some of which seem to be political). The return of the exiles from Babylon reinforced the Jewish population, which gradually became more dominant and expanded significantly. It was during this period that the Second Temple in Jerusalem was built. Sabastiye, near Nablus, was the northernmost province of the Persian administration in Palestine, and its southern borders were drawn at Hebron. Some of the local population served as soldiers and lay people in the Persian administration, while others continued in agriculture. In 400 B.C.E., the Nabataeans made inroads into southern Palestine and built a separate civilization in the Negev that lasted until 160 B.C.E. The Persian Empire soon fell under the Greek forces of the Macedonian general Alexander the Great. After his death, with the absence of heirs, his conquests were divided amongst his generals, while the region of the Jews ("Judah" or Judea as it became known) was first part of the Ptolemaic dynasty and then part of the Seleucid Empire. 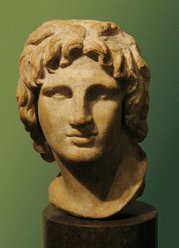 There were over 30 kings of the Seleucid dynasty from 323 B.C.E. to 60 B.C.E. At its greatest extent, the Empire comprised central Anatolia, the Levant, Mesopotamia, Persia, Turkmenistan, Pamir and the Indus valley. The landscape during this period was markedly changed by extensive growth and development that included urban planning and the establishment of well-built fortified cities. Hellenistic pottery was produced that absorbed Philistine traditions. Trade and commerce flourished, particularly in the most Hellenized areas, such as Askalan, Gaza, Jerusalem, Jaffa, and Nablus (Sabastiya, Tel Balata and Jabal Jizrim). The Jewish population in Judea was allowed limited autonomy in religion and administration. In the second century B.C.E. fascination in Jerusalem for Greek culture resulted in a movement to break down the separation of Jew and Gentile and some people even tried to disguise the marks of their circumcision. Disputes between the leaders of the reform movement, Jason and Menelaus, eventually led to civil war and the intervention of Antiochus IV Epiphanes. In 167 B.C.E., after Antiochus issued decrees in Judea forbidding Jewish religious practice, a rural Jewish priest, Mattathias the Hasmonean, sparked the revolt against the Seleucid empire by refusing to worship the Greek gods. Mattathias slew a Hellenistic Jew who stepped forward to offer a sacrifice to an idol in Mattathias' place. He and his five sons fled to the wilderness of Judea. After Mattathias' death about one year later, his son Judah Maccabee led an army of Jewish dissidents to victory over the Seleucid dynasty. The revolt itself involved many individual battles, in which the Maccabean forces gained infamy among the Syrian army for their use of guerrilla tactics. 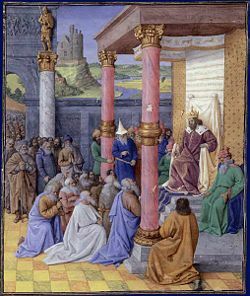 After the victory, the Maccabees entered Jerusalem in triumph and ritually cleansed the Temple, re-establishing traditional Jewish worship there and installing Jonathan Maccabee as high priest. A large Syrian army was sent to quash the revolt, but returned to Syria on the death of Antiochus IV. Its commander Lysias, preoccupied with internal Syrian affairs, agreed to a political compromise that provided religious freedom. 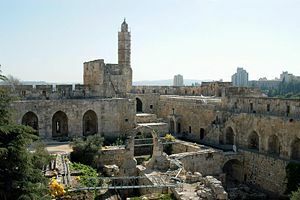 Following the re-dedication of the temple, the supporters of the Maccabees were divided over the question of whether to continue fighting. Those who sought the continuation of the war of national identity were led by Judah Maccabee. On his death in battle in 160 B.C.E., Judah was succeeded as army commander by his younger brother, Jonathan, who was already high priest. Every year Jews celebrate Hanukkah in commemoration of Judah Maccabee's victory over the Seleucids and subsequent miracles. On Jonathan's death in 142 B.C.E., Simon Maccabeus, the last remaining son of Mattathias, took power. Simon founded the Hasmonean Dynasty, which lasted until 37 B.C.E. The kingdom was the only independent Jewish state to exist in the four centuries after the Kingdom of Judah was destroyed in 586 B.C.E., and was one of the last before the modern state of Israel. Judah became an independent state in 141 B.C.E., Herod conquered Judah in 37 B.C.E., and rebuilt the Temple in 19 B.C.E. 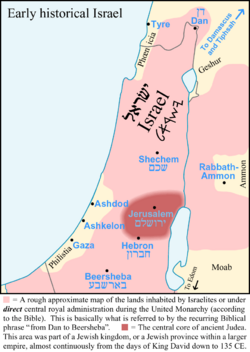 The Jewish Kingdom of Judea controlled most of the region of Palestine (without the Negev but with the West Bank, Golan, and parts of the Gaza Strip) and parts of eastern Jordan. After approximately a century of independence disputes between the Hasmonean rivals Aristobulus II and Hyrcanus II led to control of the kingdom by the Roman army of Pompey. Rome's involvement in the area dated from 63 B.C.E., after the Third Mithridatic War, when Rome made Syria a province. Judea's Hasmonean Kingdom—first a client kingdom of the Roman Empire, after year 6 C.E. the Iudaea Province—were in nearly constant revolt against Roman occupation. The First Jewish-Roman War began in 66 C.E. and resulted in the destruction of Jewish temple in Jerusalem in 70 C.E. Around 40–39 B.C.E., Herod the Great was appointed King of the Jews by the Roman Senate. Prosperity marked his long reign (37–4 B.C.E.). Between 31 and 20, Caesar Augustus restored to Herod the Jewish territories that Pompey had taken, and Herod created an efficient Hellenistic administrative system. With nine wives and a large family, Herod had succession problems, which he tried to solve by having his wife Mariane and several sons killed. His death in 4 B.C.E. led to a period of rule divided between his three surviving sons, which led to the return of direct Roman government. Around 4 B.C.E., Jesus of Nazareth and John the Baptist were born. While Pontius Pilate was governor of Iudaea (26–36 C.E. ), John the Baptist was beheaded, and Jesus was crucified. Jesus inspired what would eventually evolve, through Paul of Tarsus, into Christianity. Herod Agrippa I, appointed "King of the Jews" by Claudius, ruled from 41–44 C.E., and Herod Agrippa II, who ruled from 48–100 C.E., was the seventh and last of the Herodians. Iudaea Province was the stage of three major rebellions—the Great Jewish Revolt (66–70 C.E. ), the Kitos War (115–117 C.E. ), and Bar Kokhba's revolt (132–135 C.E.). An anti-Jewish Roman procurator had the Jewish Temple destroyed in 70 C.E. The last revolt was sparked when the emperor Hadrian announced plans to build a Roman colony, Aelia Capitolina, on the site of Jerusalem. The revolt was ruthlessly repressed—almost one thousand villages were destroyed and more than half a million people killed. Hadrian expelled most Jews from Judea on the pain of death, leaving large Jewish populations in Samaria and the Galilee. Tiberias became the headquarters of exiled Jewish patriarchs. In an attempt to erase the historical ties of the Jewish people to the region, and to humiliate the defeated Jews, Hadrian changed the name of the province to Syria Palaestina, named after the Philistines, who the Romans identified as the worst enemies of the Jews. From then on the region was known as Palestine. Hadrian rebuilt Jerusalem as a Greco-Roman city, with a circus, an amphitheatre, baths, a theatre and with streets laid out in a grid pattern. Jews were initially banned, and later allowed for a single yearly visit. Emperor Constantine's conversion to Christianity around 330 C.E. made Christianity the official religion of Palaestina. After his mother Empress Helena identified the spot she believed to be where Jesus was crucified, the Church of the Holy Sepulcher was built in Jerusalem. The Church of the Nativity in Bethlehem and the Church of the Ascension in Jerusalem were also built during Constantine's reign. Palestine thus became a center for pilgrims and ascetic life for men and women from all over the world. Many monasteries were built including the Saint George Monastery in Wadi al-Qilt, Deir Quruntul and Deir Hijle near Jericho, and Deir Mar Saba and Deir Theodosius east of Bethlehem. In 352, a Jewish revolt against Byzantine/Roman rule in Tiberias and other parts of the Galilee was brutally suppressed by Gallus Caesar. Under Marcian (450–457) and again under Justinian I (527–565), the Samaritans revolted. Constantine added the southern part of Arabia to the province, but later made the addition a separate province, later called Palaestina Tertia or Salutaris. By the end of the fourth century, Palaestina was further organized into three units: Palaestina Prima, Secunda, and Tertia (First, Second, and Third Palestine).Palaestina Prima consisted of Judea, Samaria, the coast, and Perea with the governor residing in Caesarea. Palaestina Secunda consisted of the Galilee, the lower Jezreel Valley, the regions east of Galilee, and the western part of the former Decapolis with the seat of government at Scythopolis. Palaestina Tertia included the Negev, southern Jordan — once part of Arabia — and most of Sinai with Petra as the usual residence of the governor. Palestina Tertia was also known as Palaestina Salutaris. In 536 C.E., Justinian I promoted the governor at Caesarea to proconsul (anthypatos), giving him authority over the two remaining consulars. 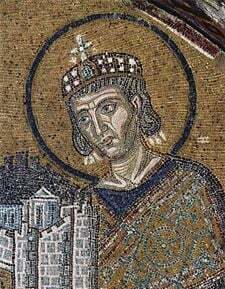 Justinian believed that the elevation of the governor was appropriate because he was responsible for "the province in which our Lord Jesus Christ... appeared on earth." This was also the principal factor explaining why Palestine prospered under the Christian Empire. The cities of Palestine, such as Caesarea Maritima, Jerusalem, Scythopolis, Neapolis and Gaza reached their peak population in the late Roman period and produced notable Christian scholars in the disciplines of rhetoric, historiography, Eusebian ecclesiastical history, classicizing history and hagiography. Byzantine administration of Palestine was temporarily suspended during the Persian occupation of 614–28, and then permanently after the Muslims arrived in 634 C.E., defeating the empire's forces decisively at the Battle of Yarmouk in 636 C.E. 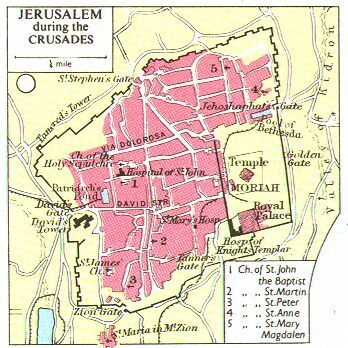 Jerusalem capitulated in 638 C.E., and Caesarea between 640 C.E. and 642 C.E. 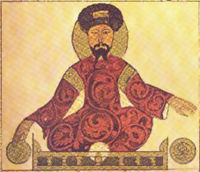 The Islamic unification of the Arabian Peninsula by the first caliph, Abu Bakr (632–634), led to Arab expansion into southern and south-eastern Syria. 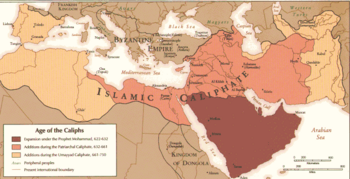 His successor, caliph Omar Ibn al-Khattab (634–644) continued the expansion. 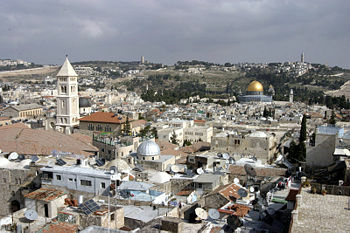 Jerusalem was considered the third holiest spot in Islam. In 638 Caliph Umar and Safforonius, the Byzantine governor of Jerusalem, signed The Umariyya Covenant, an agreement that stipulated the rights and obligations of all non-Muslims in Palestine. Jews were permitted to return to Palestine for the first time since the five-hundred-year ban enacted by the Romans and maintained by Byzantine rulers. Caliph Omar (634–644) was the first conqueror of Jerusalem to enter the city on foot, and when visiting the site that houses the Haram al-Sharif, he declared it a sacred place of prayer. 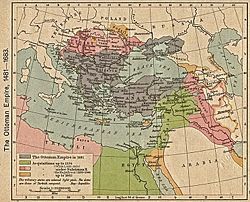 Under Umayyad rule (661–750), the province of ash-Sham (Greater Syria), of which Palestine was a part, was divided into five districts, and was one of the main provinces of the empire. 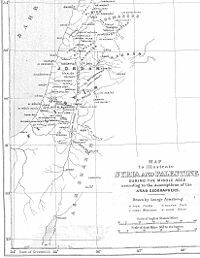 Jund Filastin (Arabic جند فلسطين, literally "the army of Palestine") was a region extending from the Sinai to the plain of Acre. 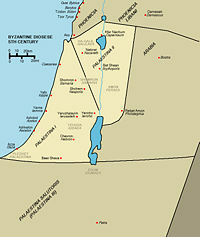 Major towns included Rafah, Caesarea, Gaza, Jaffa, Nablus and Jericho. Initially Lod was the capital, but in 717 the newly established city of Ramleh became the capital. Jund al-Urdunn (literally "the army of Jordan") was a region to the north and east of Filastin. Major towns included Legio, Acre, Bisan and Tyre and the capital was at Tiberias. Each jund was administered by an emir assisted by a financial officer. This pattern continued until the time of Ottoman rule. The Umayyads paid special attention to Palestine—it was important in their struggle against Iraq and the Arabian Peninsula. In 691 Caliph Abd al-Malik ibn Marwan ordered that the Dome of the Rock be built on the site of the Temple of Solomon, where the Prophet Muhammad is believed to have begun his journey to heaven, on the Temple Mount. 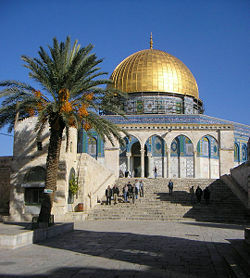 Close to the shrine and to the south about a decade afterward, Caliph Al-Walid I had the larger Al-Aqsa Mosque built. Conversions to Islam, together with immigration, meant the Christian population gradually became predominantly Muslim and Arabic-speaking. During the early years of Muslim control, a small permanent Jewish population returned to Jerusalem after a five-hundred-year absence. It was under Umayyad rule that Christians and Jews were granted the official title of "Peoples of the Book" to underline the common monotheistic roots they shared with Islam. Palestine was not as central to the Baghdad-based Abbasid rulers (750-969 ), though the Abbasid Caliphs did visit the holy shrines and sanctuaries in Jerusalem and continued to build up Ramleh. Enmity between Umayyads and Abbasids became a political factor in Palestine, and pro-Umayyad uprisings were frequent. Coastal areas were settled and fortified to secure it against the Byzantine enemy. Port cities like Acre, Haifa, Caesarea, Arsuf, Jaffa and Ashkelon received money from the state treasury. A trade fair took place in Jerusalem every year on September 15 where merchants from Pisa, Genoa, Venice and Marseilles converged to acquire spices, soaps, silks, olive oil, sugar and glassware in exchange for European products. European Christian pilgrims visited and made generous donations to Christian holy places in Jerusalem and Bethlehem. Palestine sustained an insurrection in 903–906 of the Qarmatians, an Isma’ili Shi'ite sect. After Abbasid authority was restored, Palestine came under Ikhshidid rule (935–969). From their base in Tunisia, the Fatimids (969–1099 C.E. ), who claimed to be descendants of the Muhammad through his daughter Fatima, conquered Palestine by way of Egypt in 969 C.E. The Fatimids established precarious control over Palestine, where they faced opposition from Qarmatians, Seljuks, Byzantines, and Bedouins. Palestine was often reduced to a battlefield, although Jerusalem, Nablus, and Askalan were expanded and renovated under their rule. Fatimid caliph al-Hakim (996–1021) reactivated discriminatory laws imposed on Christians and Jews and added new ones. In 1009, he ordered the destruction of the Church of the Holy Sepulchre, which was severely damaged as a result. After the tenth century, the division into Junds began to break down. In 1071, the Isfahan-based Seljuk Turks captured Jerusalem, which prospered as pilgrimages by Jews, Christians, and Muslims increased. The Fatimids recaptured the city in 1098, only to lose it a year later to a new enemy, the Crusaders of Western Europe. The Crusades, a series of military conflicts of a religious character, waged by Christians from 1095–1291, had the goal of recapturing Jerusalem and the sacred "Holy Land" from Muslim rule. They were launched in response to a call from the Eastern Orthodox Byzantine Empire for help against the expansion of the Muslim Seljuq dynasty into Anatolia, and the first five crusades had the blessing of the pope. The Latin Kingdom of Jerusalem was established on Christmas Day, 1100 C.E. This was a Christian kingdom that lasted less than two hundred years—until 1291—when the last remaining outpost, Acre, was destroyed by the Mamluks. At first the kingdom was little more than a loose collection of towns and cities captured during the crusade. At its height, the kingdom roughly encompassed the territory of modern Israel, the West Bank, and the Gaza Strip; it extended from modern Lebanon in the north to the Sinai Desert in the south, and into modern Jordan and Syria in the east. There were also attempts to expand the kingdom into Fatimid Egypt. Its kings also held a certain amount of authority over the other crusader states, Tripoli, Antioch, and Edessa. 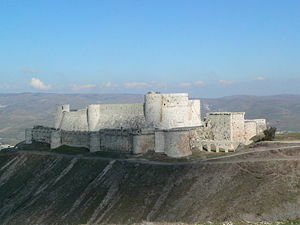 Under the European rule, fortifications, castles, towers and fortified villages were built, rebuilt and renovated across Palestine, largely in rural areas. A notable urban remnant of the Crusader architecture of this era is found in Acre's old city. At first the Muslim world had little concern for the fledgling kingdom, but as the twelfth century progressed, the notion of jihad was resurrected, and the kingdom's increasingly-united Muslim neighbors vigorously began to recapture lost territory. In July 1187, the Cairo-based Kurdish General Saladin commanded his troops to victory in the Battle of Hattin, and went on to take Jerusalem. The Ayyubid Sultanate, founded by Saladin, controlled Jerusalem from 1187-1244, and some of the region until 1250, when it was defeated by the Mamluk Sultanate of Egypt. An agreement granting special status to the Crusaders allowed them to continue to stay in Palestine and in 1229, Frederick II negotiated a ten-year treaty that placed Jerusalem, Nazareth and Bethlehem once again under crusader rule. In 1270, Sultan Baibars expelled the crusaders from most of the country, though they maintained a base at Acre until 1291. Thereafter, any remaining Europeans either went home or merged with the local population. Mamluks were slave-soldiers who were converted to Islam and served the Muslim caliphs and the Ayyubid sultans during the Middle Ages. Over time they became a powerful military caste, and on more than one occasion they seized power for themselves, for example, ruling Egypt in the Mamluk Sultanate from 1250–1517. Palestine formed a part of the district of Damascus under the rule of the Mamluk Sultanate and was divided into three smaller districts with capitals in Jerusalem, Gaza, and Safad. Celebrated by Arab and Muslim writers of the time as the "blessed land of the Prophets and Islam's revered leaders," Muslim sanctuaries were "rediscovered" and received many pilgrims. While during the first half of the Mamluk era (1270–1382), many schools, lodgings for travelers (khans) were built and mosques neglected or destroyed during the Crusader period were renovated, the second half (1382–1517) was a period of decline as the Mamluks were engaged in battles with the Mongols in areas outside Palestine. In 1486 hostilities broke out between the Mamluks and the Ottoman Turks in a battle for control over western Asia. The Mamluk armies were eventually defeated by the forces of the Ottoman Sultan, Selim I, and lost control of Palestine after the 1516 battle of Marj Dapiq. 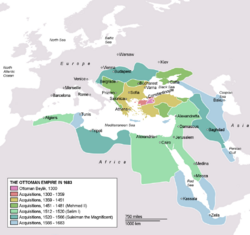 Ottoman rule lasted from 1516–1917. In 1516 the Ottoman Turks occupied Palestine, and the country became part of the Ottoman Empire. Constantinople appointed local governors. Public works, including the city walls, were rebuilt in Jerusalem by Suleiman the Magnificent in 1537. An area around Tiberias was given to Don Joseph HaNasi for a Jewish enclave. Following the expulsions from Spain, the Jewish population of Palestine rose to around 25 percent (including non-Ottoman citizens, and excluding Bedouins) and regained its former stronghold of Eastern Galilee. That ended in 1660 when they were massacred at Safed and Jerusalem. During the reign of Dahar al Omar, Pasha of the Galilee, Jews from Ukraine began to resettle Tiberias. Napoleon Bonaparte of France briefly waged war against the Ottoman Empire (then allied with Great Britain). His forces conquered and occupied cities in Palestine, but they were finally defeated and driven out by 1801. In 1799 Napoleon announced a plan to re-establish a Jewish state in Palestine which was mostly to curry favor with Haim Farkhi, Jewish finance minister and advisor to the Pasha of Syria/Palestine. He was later assassinated and his brothers formed an army with Ottoman permission to conquer the Galilee. Jewish immigration to Palestine, particularly to the "four sacred cities" (Jerusalem, Safed, Tiberias and Hebron) which already had significant Jewish communities, increased particularly towards the end of Ottoman rule; Jews of European origin lived mostly off donations from off-country, while many Sephardic Jews found themselves a trade. Many Circassians and Bosnian Muslims were settled in the north of Palestine by the Ottomans in the early nineteenth century. In the 1830s Egypt conquered Palestine and made some minor improvements and many Egyptians, in particular soldiers, settled there. It was however during this period that the Jews of Safed were massacred in 1831 by Druzes. Safed was resettled with Kurds and Algerians. This was followed in 1837 by earthquakes in Safed and Tiberias. In 1838 Palestine was returned to the Turks. After the Ottoman conquest, the name "Palestine" disappeared as the official name of an administrative unit, as the Turks often called their (sub)provinces after the capital. Since its 1516 incorporation in the Ottoman Empire, it was part of the vilayet (province) of Damascus-Syria until 1660, next of the vilayet of Sidon. Still the old name remained in popular and semi-official use. Many examples of its usage in the sixteenth and seventeenth centuries have survived. 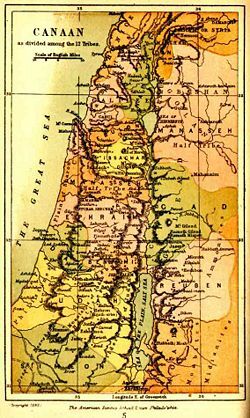 During the nineteenth century, the Ottoman Government employed the term Arz-i Filistin (the "Land of Palestine") in official correspondence, meaning the area to the west of the River Jordan. Among the educated Arab public, Filastin was a common concept, referring either to the whole of Palestine or to the Jerusalem sanjaq alone, or just to the area around Ramle. 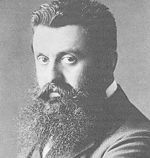 Ottoman rule over the region lasted until World War I.
Theodor Herzl (1860–1904), an Austro-Hungarian Jew, who founded the Zionist movement, in 1896 published Der Judenstaat (“The Jewish State”), calling for the establishment of a Jewish state. The following year he helped convene the first World Zionist Congress. Moses Hess and others promoted the idea of the "redemption of the soil." The rise of Zionism increased Jewish immigration, the first big wave of which started in 1881 as Jews fled growing persecution in Russia. The Second Aliyah (1904–1914) brought an influx of around 40,000 Jews, many of whom bought land from individual Arab landholders. Towards the end of the nineteenth and in the early years of the twentieth centuries, Palestinian Arabs shared in an Arab renaissance, sat in the Ottoman parliaments, and Arabic newspapers appeared, displaying strong Arab nationalism and opposition to Jewish immigration and land purchases. There were 19 Zionist colonies in Palestine in 1900, while in 1918 there were 47. Most were subsidized by the French philanthropist Edmond baron de Rothschild. Up to World War I, the word "Palestine" was used informally for a region that extended in the north-south direction typically from south-east of Gaza to the Litani River (later in Lebanon). The western boundary was the sea, and the eastern boundary was the poorly defined place where the Syrian Desert began. In various European sources, the eastern boundary was placed anywhere from the Jordan River to slightly east of Amman. The Negev Desert was not included. In World War I, Turkey sided with Germany and came into conflict with Great Britain. The British-led Egyptian Expeditionary Force, commanded by Edmund Allenby, 1st Viscount Allenby, captured Jerusalem on December 9, 1917, and occupied the Levant following the defeat of Turkish forces at the Battle of Megiddo in September 1918. At the subsequent 1919 Paris Peace Conference and Treaty of Versailles, Turkey's loss of its Middle East empire was formalized. During World War I, the great powers made a number of decisions about Palestine without regard to the people of the region. Palestinian Arabs believed 1915-16 correspondence between the British High Commissioner in Egypt, Sir Henry McMahon, and the Emir of Mecca, Hussein ibn Ali, indicated an undertaking to form an Arab state, in return for Arab support against the Ottomans during the war. Yet, the Sykes-Picot Agreement of 1916 envisioned that most of Palestine, when freed from Ottoman control, would become an international zone not under direct French or British colonial control. A further complication came when British foreign minister Arthur Balfour issued the Balfour Declaration of 1917, which laid plans for a Jewish homeland to be established in Palestine eventually, while respecting the rights of the indigenous majority. At the end of the war, the future of Palestine was a problem. Great Britain had set up a military administration there after capturing Jerusalem. On March 20, 1920, Palestinian delegates at a general Syrian congress at Damascus, passed a resolution which rejected the Balfour Declaration, and elected Faisal I, the son of Hussein ibn Ali, who ruled the Hejaz, the king of a united Syria, which included Palestine. In April 1920, by which time Jews made up 11 percent of the population of Palestine, anti-Zionist riots broke out in Jerusalem, killing several and injuring many. The British installed a civilian administration in July of that year, and Zionist Sir Herbert Samuel, who became the first high commissioner, proceeded to implement the Balfour Declaration, and announced a quota of 16,500 Jewish immigrants for the first year. In December 1920, Palestinian Arabs drew up the Arab Executive, which declared Palestine was an autonomous Arab entity, rejecting any rights of the Jews to Palestine. Meanwhile, the arrival of more than 18,000 Jewish immigrants between 1919 and 1921, and land purchases in 1921 by the Jewish National Fund, and the eviction of Arab peasants (fellahin), led to anti-Zionist riots in Jaffa, on May 1, 1921, which spread. About one hundred people were killed. On April 11, 1921, the British passed administration of the eastern region to the Hashemite Arab dynasty from the Hejaz what later became part of Saudi Arabia as the Emirate of Transjordan, and on May 15, 1923, recognized it as a state. An Arab delegation, which visited London in late 1921, demanded repudiation of the Balfour Declaration, and proposed creating a national government with a parliament elected by Muslims, Christians, and Jews. The British government issued its White Paper in June 1922 declaring that while Britain did not intend that all of Palestine should become a Jewish national home, such a home should be founded within Palestine, that immigration would not exceed levels the country could absorb, and that steps would be taken to set up a legislative council. Arabs rejected these proposals. In July 1922, the League of Nations approved the mandate for Palestine, accepted the preamble incorporating the Balfour Declaration, and affirmed the Jewish historical connection with Palestine. 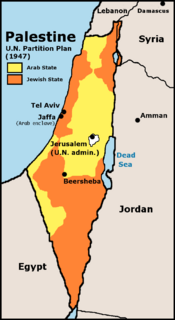 The British Mandate of Palestine lasted from 1920 to 1948, and covered territories later comprising Jordan, Israel and territories governed in different degrees of control by the Palestinian Authority. It was originally bordered by the Mediterranean Sea to the West, the French Mandate of Lebanon, French Mandate of Syria, and the British Mandate of Mesopotamia to the North, the Kingdom of Saudi Arabia to the East and South, and the Kingdom of Egypt to the Southwest. This distinct Palestinian political entity, the first in centuries, created problems for Palestinian Arabs and Zionists alike. The central issues were Jewish immigration and land purchases, conflict over which often escalated into violence. Formal use of the English word "Palestine" returned with the British Mandate, which enacted English, Hebrew and Arabic as its three official languages. Palestine became the formal name of the entity in English and Arabic while Palestina (Eretz Yisrael) ((פלשתינה (א"י) was the formal name in Hebrew. Traditional rivalry between two old Jerusalem families, the Husaynis and the Nashashibis, whose members had held government posts in the late Ottoman period, helped fragment Arab leadership. In 1921, the British appointed Amin al-Husseini to be the mufti of Jerusalem, and made him president of the new Supreme Muslim Council, which controlled the Muslim courts and schools and funds raised by religious charities. The anti-British Husseini family led most Arab groups opposing Jewish immigration. The World Zionist Organization was regarded as the “Jewish agency” set out in the mandate. Its president, Chaim Weizmann, worked from London, close to the British government, while Polish-born David Ben-Gurion led an executive in Palestine. The Palestine Jewish community set up its own assembly (Va'ad Leumi), labor movement (Histadrut), schools, courts, taxation system, medical services, industrial enterprises, and a military organization called the Haganah. The Labour Zionists, who believed in cooperation with the British and Arabs, controlled the Jewish Agency. Another group, the Revisionist Zionists, led by Vladimir Jabotinsky, recognized their goal of a Jewish state in all of Palestine clashed with that of Palestinian Arabs, and formed their own military wing, Irgun, which used force against the Arabs. Jews bought large tracts of land from often absentee Arab owners. In August 1929, an enlarged Jewish Agency included non-Zionist Jewish sympathizers throughout the world. A dispute in Jerusalem concerning the Western Wall, the only remnant of the Second Temple as well as the site of the Dome of the Rock—sparked fighting in which 250 were killed and 570 wounded. The British government conducted an inquiry and issued the Passfield White Paper, in October 1930, which called for a halt to Jewish immigration, recommended that land be sold only to landless Arabs, and that the question of “economic absorptive capacity” be based on levels of Arab and Jewish unemployment. Palestinian Jews and London Zionists protested, and in February 1931, the British prime minister, Ramsay MacDonald, wrote to Chaim Weizmann nullifying the Passfield White Paper. Arabs saw that recommendations made in Palestine could be annulled by Zionist influence in London, so in December 1931, a Muslim congress in Jerusalem attended by delegates from 22 countries warned against the danger of Zionism. The Nazis rose to power in Germany in 1933, and the persecution of Jews throughout Europe increased Jewish immigration, which rose to 30,000 in 1933, 42,000 in 1934, and 61,000 in 1935, provoking acts of violence against Jews and the British in 1933 and 1935. The Arab population of Palestine also grew rapidly. A further Arab demand to end Jewish immigration, prohibit land transfer, and establish democratic institutions led nowhere. Rising nationalism in Egypt and Syria, increasing unemployment in Palestine and a poor citrus harvest touched off an Arab revolt, which lasted from 1936–1939. In April 1936, two Jews were murdered, violence escalated, and Arab groups began a general strike in Jaffa and Nabulus. The Jerusalem mufti presided over an Arab high committee that repeated demands for the end of Jewish immigration, land sales and independence, as well as calling for a general strike, a tax revolt and closure of government offices. Meanwhile, Arab rebels and volunteers from other countries attacked Jewish settlements. A British inquiry, the Peel Commission, in July 1937, declared the mandate unworkable, recommended that the region be partitioned, recommended an area much greater than existing Jewish land holdings, and advocated the transfer by force of the Arab population. Horrified, Arabs escalated the revolt, until September 1937, when the British declared martial law. The revolt left more than five thousand Arabs dead, 15,000 wounded, and 5,600 were imprisoned. The general strike encouraged Zionist self-reliance, the revolt united Jewish settlers behind Ben-Gurion, and Haganah was given permission to arm itself. Traditional Arab leaders were killed, arrested or deported, leaving a dispirited, disarmed and divided Arab population. A subsequent Woodhead Commission report in November 1938 recommended against the Peel Commission's plan, and put forward an alternative which reduced the area of the Jewish state and limited the sovereignty of the proposed states. In May 1939, the British government White Paper said that the Jewish national home should be established within an independent Palestinian state, and that Jewish immigration would be limited to 75,000 during the next five years, after which Jewish immigration would be subject to Arab agreement. Both Arabs and Zionists rejected the White Paper, which marked the end of cordial relations between Zionism and the British government. By 1940, the number of rural Zionist colonies had increased to about two hundred; Jewish landholdings had risen to 383,500 acres, or one-seventh of the cultivatable land, the Jewish population had reached 467,000, about one-third of a total population of about 1,528,000, and Tel Aviv was an all-Jewish city of 150,000 inhabitants. Between 1939 and 1945 German Nazis killed more than six million Jews in the Holocaust, a horror that gave new impetus to the movement to form a Jewish state. British attempts to prevent Jewish immigration to Palestine in the face of the Holocaust led to the disastrous sinking of two ships carrying Jewish refugees—the Patria (November 1940) and the Struma (February 1942). In response, Irgun, led by Menachem Begin, and LEHI (Fighters for the Freedom of Israel), also known as the Stern Gang, launched attacks on the British, culminating in the murder of Lord Moyne, a British minister of state, in Cairo in November 1944. 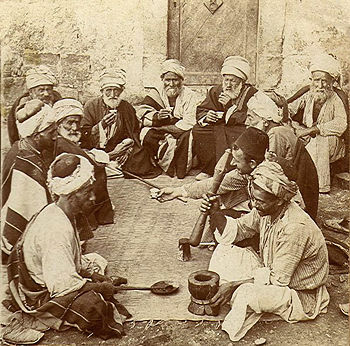 Arabs in Palestine remained quiet throughout the war. Amin al-Husseini had fled to Germany, from where he tried to rally Arabs in support of the Axis Powers against Britain and Zionism. Most supported the Allies—approximately 23,000 Arabs enlisted in the British forces, as did 27,000 Jews. In August 1945, U.S. President Harry S. Truman asked British Prime Minister Clement Attlee to allow 100,000 Jewish Holocaust survivors into Palestine. In October 1944, Arab heads of state issued the Alexandria Protocol, which said that although they regretted the bitter fate inflicted upon European Jewry, solving the problem of European Jewry should not be achieved by inflicting injustice on Palestinian Arabs. The Arab League, formed in March 1945, appointed an Arab Higher Executive for Palestine, and later declared a boycott of Zionist goods. Lebanon had attained independence in 1941, Syria in 1942 and Jordan in May of 1946. In November 1945, an Anglo-American committee of inquiry was set up to study the Palestinian issue. A conference in 1946 worked out a plan of provincial autonomy for Arabs and Jews. Zionist underground forces escalated attacks, culminating in Jerusalem on July 22, 1946, when Irgun blew up a part of the King David Hotel, which contained British government and military offices, killing 91 people. After World War II, Britain lacked the money and political will to maintain colonial possessions that were violently agitating for independence. In early 1947, Britain referred the Palestine question to the United Nations. On August 31, the UN Special Committee on Palestine recommended that the region be partitioned into an Arab and a Jewish state, with Jerusalem and its environs an international zone. The UN General Assembly adopted these recommendations in a resolution dated November 29, 1947. The Zionists welcomed the proposal but the Arabs opposed it because nearly half of the population of the Jewish state would be Arab. Fighting broke out in Palestine. In December 1947, the Arab League organized a force of three thousand volunteers to support the Palestinian Arabs. On March 19, 1948, the United States urged the UN Palestine Commission to suspend its actions, and on March 30 it called for a truce. The Zionists launched two offensives during April. An Arab attack on a Zionist settlement failed; Arab national hero 'Abd al-Qadir al-Huseini was killed in battle, while Irgun and the Stern Gang killed inhabitants of the Arab village of Dayr Yasin. On April 22, Zionists captured Haifa, and Jaffa surrendered on May 13. On May 14, the British high commissioner left Palestine, and the State of Israel was declared, recognized by the United States and the Soviet Union. Early the next day, Syrian, Transjordan, Iraqi, and Egyptian troops invaded. By December 1948, the Arab troops were routed, and by June 1949 Israel had armistices with its neighbors, was recognized by 50 nations, had joined the United Nations and established sovereignty over about eight thousand square miles (21,000 square kilometers) of territory west of the Jordan River. The outbreak of war meant the UN partition plan was never implemented. The war of partition displaced the Arab population, who either were driven out by military forces or fled. Wealthy merchants and urban luminaries from Jaffa, Tel Aviv, Haifa, and Jerusalem fled to Lebanon, Egypt, and Jordan. The middle class moved to Arab towns like Nabulus and Nazareth. Most fellahin (poor rural dwellers) ended up in refugee camps. More than four hundred Arab villages disappeared, and the center of Palestinian life shifted to the Arab towns of the hilly region west of the Jordan River called the West Bank. Estimates of the number of Arabs displaced from 1947 to 1949 range from 520,000 to about one million. 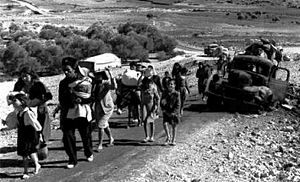 This Palestinian exodus is referred to by Palestinians as the Nakba ("disaster" or "cataclysm"). Of those Arabs who stayed, about 150,000 remained in Israel—about one-eighth of all Palestinians and in 1952, about the same proportion of the Israeli population. The entire Jewish population of the West Bank and Gaza Strip fled to Israel. Over the following years approximately 850,000 Sephardi Jews and Mizrahi Jews fled or were expelled from surrounding Arab countries. Of these, about 600,000 settled in Israel; the remainder went to Europe and the Americas. Until Israel was established, the term “Palestinian” was used by Jews and foreigners to describe the inhabitants of Palestine. The Arabs of the region began using the term “Palestinian” before World War I, reflecting a nationalist concept of a Palestinian people. After 1948, the term represented a shared past and the goal of a Palestinian state. In 1949 Jordan extended citizenship to Palestinians and provided education. But tension developed between original Jordanians and the better educated newcomers. Palestinians soon made up two-thirds of the population of Jordan, and half the seats in the Jordanian Chamber of Deputies were reserved for West Bank representatives. However, most Jordanian Palestinians tended to support the radical pan-Arab and anti-Israeli policies of Egypt’s President Gamal Abdul Nasser. Egypt controlled the 25-mile-long Gaza Strip from 1948–1967, under repressive rule that denied Palestinians living in the region any citizenship. In 1948, Amin al-Husseini declared a short-lived government of All Palestine in the Gaza Strip. The Gaza Strip became one of the world’s most densely populated areas. 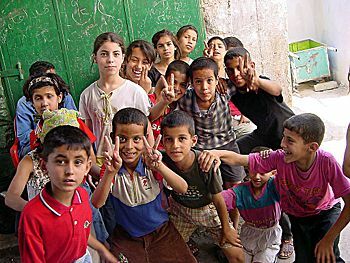 Mostly urban, poverty, unemployment and social misery became characteristic of life in the region in which numerous Palestinians depended on welfare in UN refugee camps. The United Nations Relief and Works Agency for Palestine Refugees in the Near East (UNRWA) was created in 1949, and in 1950 created 53 refugee “camps” on both sides of the Jordan River, and in the Gaza Strip, Lebanon and Syria. Initially refugees lived under harsh conditions in tents, which were replaced by small houses of concrete blocks with iron roofs. Palestinians who remained in refugee camps became more alienated than those who found jobs. By the mid-1960s, a young, educated Palestinian leadership emerged, from UNRWA schools, and from universities in Egypt, Syria, Lebanon, Western Europe and the United States, replacing discredited traditional leaders. Refugees in the camps began to share in a Palestinian identity based on a pan-Arabism inspired by Nasser. Also a class of educated, mobile Palestinians who worked for the oil companies, civil services, and educational institutions of Arab states appeared. The Palestine Liberation Organization (PLO) was formed after an Arab summit meeting in Cairo in 1964. Its first leader was Egypt protégé Ahmad Shuqayri. An umbrella organization of several Palestinian groups, the PLO, which claimed to be the sole representative of Palestinian people, sought an independent state, to liberate Palestine, and destroy the State of Israel. The Palestine National Liberation Movement (Fatah) was formed earlier. Other groups included the Popular Front for the Liberation of Palestine, the Democratic Front for the Liberation of Palestine, the Popular Front for the Liberation of Palestine – General Command, and the Syrian-backed al-Saiqah. 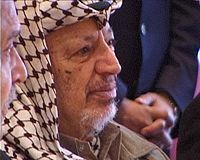 Fatah leader Yasser Arafat became chairman of the PLO in 1969. 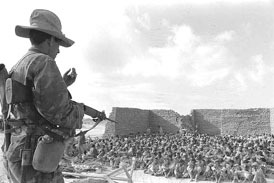 Tensions arose between Israel and neighboring countries in May 1967. Syria, Jordan and Egypt had been hinting at war and Egypt expelled UN Peacekeeping Forces from the Gaza Strip. When Egypt closed the strategic Straits of Tiran to Israeli vessels and began massing large numbers of tanks and aircraft on Israel's borders, Israel preemptively attacked Egypt on June 5. In the ensuing Six-Day War, Israel defeated three large Arab states, conquered the West Bank, Gaza Strip, Sinai Peninsula and Golan Heights. The Green Line of 1949 became the administrative boundary between Israel and the Occupied Territories. The Sinai was later returned to Egypt following the signing of a peace treaty. More than 250,000 Palestinians fled to the eastern bank of the Jordan River. Three million Israeli Jews came to rule some 1.2 million Arabs, while a movement developed among Israelis who advocated settling the occupied territories, particularly the West Bank. The Arab-Israeli war had discredited Nasser's pan-Arabism, and after 1967 Fatah launched a new wave of attacks, with the result that Palestinian guerrilla groups, under the PLO, emerged as a force in the Middle East. Terror attacks against Israeli citizens became a key part of PLO strategy. Palestinian guerrillas controlled their own bases in Jordan until tension erupted into the Black September war, in September 1970, between the Jordanian army loyal to King Hussein and the Palestinian guerrillas. On September 6–9, 1970, the Popular Front for the Liberation of Palestine hijacked three airliners with a total of more than three hundred people aboard to a Jordanian airstrip in a bid to free Palestinian guerrillas detained in Europe and Israel. The passengers were freed when the hijackers’ demands were met, although the airliners were destroyed. At the 1972 Olympic Games in Munich, Germany, Palestinian militants held hostage and killed members of the Israeli delegation. Agents of Israel’s Mossad assassinated most of those who were involved in the massacre. On October 6, 1973, the day of the Jewish Yom Kippur fast, the Egyptian and Syrian armies launched a surprise attack against Israel. Egypt and Syria were repelled, and a number of years of relative calm ensued. Driven from Jordan, the PLO raided Israel from Lebanon. Israel countered with raids into southern Lebanon. The Lebanese government tried to restrict the Palestinian guerrillas, which led to fighting between the Lebanese army and the guerrillas. An Israeli commando attack in Beirut in April 1973 killed three PLO leaders, while the Lebanese army attacked PLO bases and refugee camps. On September 22, 1974, the UN General Assembly included the “Palestine question” as a separate subject for debate, and on November 13, Arafat put his case to the assembly. At an Arab summit held in Rabat, Morocco, in October, 1974, King Hussein accepted a resolution that any “liberated” Palestinian territory “should revert to its legitimate Palestinian owners under the leadership of the PLO.” By the end of the 1970s, the PLO had representatives in more than 80 countries. Civil war between Lebanon's Christian and Muslim militias erupted in 1975, bringing 15 years of fighting which killed more than 100,000 people. The presence of Palestinians was a factor. In January 1976, Christian Maronite Phalange militia blockaded the Palestinian refugee camps, while Palestinian forces and Lebanese allies attacked Christian villages. The PLO proved unable to protect the Palestinian population. In August, Christian forces killed up to three thousand Palestinians in the Tall al-Zatar camp northeast of Beirut. Palestinian guerrillas continued to mount attacks from Lebanon against Israel. On March 11, 1978, a Palestinian raid into Israel killed 36 tourists and wounded 80 others. Israel invaded southern Lebanon three days later. On March 19, the UN Security Council passed resolution 425, which called for Israel to withdraw and established the UN Interim Force in Lebanon (UNIFIL). The Israelis partly withdrew. Israeli settlements in the West Bank proliferated in the late 1970s and early 1980s, as part of a Likud Party policy to maintain dominance. The PLO built its own youth groups, provided welfare, and set up a rival political infrastructure that enabled PLO-supported candidates to win in the municipal elections of 1976. By the early 1980s the PLO had a bureaucracy that provided health, housing, educational, legal, media, and labor services for Palestinians. Opposition to Israeli control of the West Bank increased, manifesting in demonstrations and strikes. 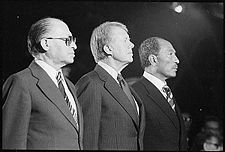 Egyptian president Anwar Sadat initiated peace talks that led to the Camp David Accords in September 1978, and to the Egyptian-Israeli peace treaty signed on March 26, 1979. The accords provided for the establishment of a self-governing authority in the West Bank and the Gaza Strip, with autonomy after five years. On June 6, 1982, Israel launched an attack against Lebanon, which had been embroiled in the civil war since 1975, to defend Israel's northernmost settlements from terrorist attacks. After establishing a 40-kilometer barrier zone, the Israel Defense Forces captured Lebanon's capital Beirut, and expelled the Palestinian Liberation Organization from the country. The expulsion of the PLO from Lebanon meant it was unable to operate freely from any nations bordering Israel. In December 1983, Arafat was driven out of northern Lebanon. In October 1985, members of the Palestine Liberation Front hijacked Italian cruise ship Achille Lauro and murdered a passenger. A Palestinian uprising called the Intifadah began in 1987. Palestinians threw rocks at Israeli soldiers occupying the Gaza Strip and the West Bank. Israelis retaliated, and the violence escalated, resulting in hundreds of deaths. The disturbances, initially spontaneous, came to be directed by the Unified National Command of the Uprising, which had links to the PLO. Tactics of the uprising involved strikes, boycotts, and demonstrations that moved around the West Bank and Gaza, frustrating the Israeli authorities who closed schools and universities, imposed curfews but could not stop the uprising. During its first year, more than three hundred Palestinians were killed, and 11,500 were wounded, while fewer than 50 Israelis were killed. During the Intifadah, a group called Hamas—an acronym for the Islamic Resistance Movement—sought to lead the intifadah. Hamas was a wing of the Muslim Brotherhood, which had established a network of religious, educational and charitable institutions in the occupied territories. In November 1988, Arafat had the Palestinian National Council issue a declaration of independence for a state of Palestine in the West Bank and Gaza Strip. The November 15, 1988, proclamation of a State of Palestine by the PLO referred to a country called Palestine, defining its borders based on the U.N. Resolution 242 and 383 and the principle of Land for Peace. The Green Line was the 1967 border established by many UN resolutions. Soon, 25 countries (excluding the United States and Israel) recognized the government-in-exile. In December, Arafat recognized Israel, condemned terrorism, including state terrorism, and proposed an international peace conference under UN auspices. During the 1990–1991 Gulf War, Iraq hit Israel with 39 Scud missiles, although Israel was not a member of the anti-Iraq coalition and was not involved in the fighting. The missiles did not kill Israeli citizens directly, but there were some deaths from incorrect use of the gas masks provided against chemical attack, one Israeli died from a heart attack following a hit, and one Israeli died from a Patriot missile hit. During the war, Israel provided gas masks for the Palestinians in the West Bank and Gaza. The PLO, however, supported Saddam Hussein. Palestinians in the West Bank and Gaza marched and famously stood on their rooftops while Scud missiles were falling and cheered Hussein. The first peace talks between Israel and Palestinian Arabs, represented by Yasser Arafat of the Palestinian Liberation Organization (PLO), held in Madrid in October 1991, gave the Palestinians responsibility for the Gaza Strip and Jericho. Further peace talks in 1993, known as the Oslo Accords, between Israeli prime minister Yitzhak Rabin, and Arafat, resulted in Israel handing over most of the Gaza Strip and parts of the West Bank to the Palestinian National Authority (PNA). In 1994, Jordan made peace with Israel. The initial wide public support for the Oslo Accords began to wane as Israel was struck by an unprecedented wave of attacks supported by the militant Hamas group, which opposed the accords. On November 4, 1995, a Jewish nationalist militant named Yigal Amir assassinated Rabin. Likud’s Benjamin Netanyahu, elected prime minister in 1996, withdrew from Hebron and signed the Wye River Memorandum, in which the PLO agreed to get rid of its terrorist groups, to confiscate illegal weapons, and to imprison their own terrorists, in return for more land on the West Bank. A U.S.-Palestinian-Israeli committee was created to convene several times a month to prevent terrorism. During Netanyahu's tenure, Israel experienced a lull in attacks by Palestinian groups, but his government fell in 1999 to Ehud Barak of One Israel. Barak withdrew from Lebanon in 2000, to frustrate Hezbollah attacks on Israel by forcing them to cross Israel's border. Barak and Palestine Liberation Organization head Yassir Arafat negotiated with U.S. President Bill Clinton at a summit at Camp David in July 2000. Barak offered a formula to create a Palestinian State, but Arafat rejected this proposal. Palestinians began a second uprising, known as the Al-Aqsa Intifadah, just after the leader of the opposition, Ariel Sharon, visited the Temple Mount in Jerusalem. Suicide bombing has, since 1993, been a particularly popular tactic amongst some Palestinian groups, including Hamas, Islamic Jihad and the Al-Aqsa Martyrs Brigade. Bombers affiliated with these groups often use so-called "suicide belts," explosive devices (often including shrapnel) designed to be strapped to the body under clothing. In order to maximize the loss of life, the bombers may seek out cafés or city buses crowded with people at rush hour, or less commonly, a military target (for example, soldiers waiting for transport at roadside). By seeking enclosed locations, a successful bomber usually kills a number of people. Palestinian television has aired a number of music videos and announcements that promote eternal reward for children who seek "shahada," which Palestinian Media Watch has claimed is "Islamic motivation of suicide terrorists." The Chicago Tribune has documented the concern of Palestinian parents that their children are encouraged to take part in suicide operations. Israeli sources have also alleged that Hamas, Islamic Jihad and Fatah operate "Paradise Camps," training children as young as 11 to become suicide bombers. Ariel Sharon was elected prime minister in March 2001, and was subsequently re-elected, along with his Likud party in the 2003 elections. Sharon initiated an Israeli withdrawal from the Gaza Strip in 2005. Israel began building the Israeli West Bank Barrier to defend against attacks by armed Palestinian groups. The barrier effectively annexes 9.5 percent of the West Bank, and creates hardships for Palestinians living near it. The international community and the Israeli far-left have criticized the wall, but it has significantly reduced the number of terrorist attacks against Israel. Hamas, an Islamic militant group fighting to replace the state of Israel with an Islamic state, won a surprise victory in the Palestinian legislative election in January 2006, taking 76 of the 132 seats in the chamber, while the ruling Fatah party took 43. After Sharon suffered a severe hemorrhagic stroke, the powers of the office were passed to Ehud Olmert, who was designated the "acting" prime minister. On April 14, 2006, Olmert was elected prime minister after his party, Kadima, won the most seats in the 2006 elections. On June 28, 2006, Hamas militants dug a tunnel under the border from the Gaza Strip and attacked an Israel Defense Forces post, capturing an Israeli soldier and killing two others. Israel bombarded Hamas targets as well as bridges, roads, and the only power station in Gaza. A conflict between the Palestinian militant group Hezbollah and Israel began July 12, 2006, with a cross-border Hezbollah raid and shelling, which resulted in the capture of two and killing of eight Israeli soldiers. Israel initiated an air and naval blockade, air strikes across much of the country, and ground incursions into southern Lebanon. Hezbollah continuously launched rocket attacks into northern Israel and engaged the Israeli Army on the ground with hit-and-run guerrilla attacks. A ceasefire came into effect on August 14, 2006. The conflict killed over one thousand Lebanese civilians, 440 Hezbollah militants, and 119 Israeli soldiers, as well as 44 Israeli civilians, and caused massive damage to the civilian infrastructure and cities of Lebanon and damaged thousands of buildings across northern Israel, many of which were destroyed. This page was last modified on 11 January 2019, at 19:45.